I think that in a way the introduction of the toll house was as a significant a development in the history of the industrial revolution as the toilet. Without the toilet, you can’t really have a concentrated population to run industries–or at least without making everyone sick because of unsanitary and pestilential conditions. If you create the possibilities for having industries that employed 100 or so people, and had a bunch of them in a city setting, it wouldn’t much matter if you didn’t have the people to run them, and you can’t have the people far-flung and living apart if there’s no way for them to get to their work. Concentrated living called for lots of innovation, and perhaps the most important of those was how to get rid of human waste. Without good roads you can’t get your produced goods to a market outside of the one you’re in, isolating chances for growth and development. If you have a good serviceable, dependable road to transport your stuff, then you have an expanded market; that means you can sell more, produce more, and theoretically charge less, which means you expand your consumer base, and on and on. But that means you have to be able t depend on your road. And a good road needs to be paid for. And one of the chief ways of funding these early roads was by a toll, which called for a toll house and a little gate. And a person to collect the money. Merchants figured out very quickly that it was much cheaper to pay a toll to use a good road than it was to use a bad road for free and have to depend on the graces that it be maintained; and since the graces weren’t kind, there would be all sorts of repairs necessary because of the poor road: harnesses, wheels, wagons, horses, and the like, not to mention food and such that could spoil along the way, or goods damaged in transport. This all comes up from looking at a curious book by WH. Pyne1, who provided a thousand or so images of “picturesque” (meaning “working or laboring) life that could be used by artists to populate more general images of landscapes or cityscapes or seascapes. I’ll address this in a later post. It was several small pictures of toll houses that caused this thinking about the industrial revolution....pictures of things intended for gentle artists who may never have seen such sights in their life, and who might need to fit a curious little image of a gate-keep in their picture of some prosaic cow-filled landscape. In the 17th and 18th centuries the introduction of serviceable roads over old trails and bad roads that connected towns wound up expanding markets for farmers and cottage industries, lowering prices because of easier availability of the product, and creating more consumers. And so on. I realize that this might very well be a "turtles all the way down" argument, but since I've already named one turtle in a post here, I might as well name two. 1. William Henry Pane (1769-1843), Picturesque groups for the embellishment of landscape : in a series of above one thousand subjects : comprising the most interesting accessories to rural and domestic scenery, shipping and craft, rural sports, pastimes and occupations, naval, military and civil employments, implements of trade, commerce and agriculture, etc. , the whole forming an encyclopaedia of illustration of the arts, agriculture, manufactures, &c. of Great Britain Publisher: London (Bedford Street, Covent Garden) : M.A. Nattali, 1845. 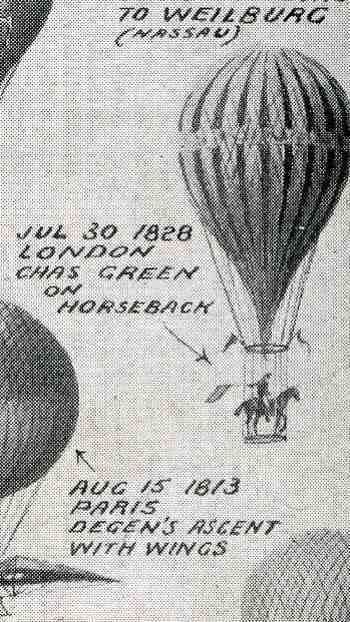 Strange Things in the Sky Department: Tetrahedra, Horse & Steamship Balloons, Swimming Pools & Exploding Moons. Rounding out the image dump from yesterday are these additions to the developing category "Strange Things in the Sky". The odd things in today's issue include floating tetrahedra, an exploding Moon, a hovering anti-gravity Dr. Seuss pool, a Russian rocket pioneer's enormous apartment building-like dirigible, and a steamship balloon. The first, without any explanation and offered as a pure art form, is this illustration by Frank R. Paul for Wonder Stories of November 1931. Other strangeness in the sky is Dr. Seuss’ swimming balloon pool from his Oh, the Thinks you can Think. . I’ve seen some interesting images of balloons and dirigibles taken as serious efforts that reminded me of that double-page spread by the good Doctor. The next entry is the ship-balloon of Thaddeus Lowe (1832-1913) One of Lowe’s great contributions in the history of ballooning was providing aerial reconnaissance via (panoramic) photographs to the Union army on Confederate army positions—particularly the Rebel positions at Richmond (1864) and Fredericksburg (1862). (He had a wide span of professional interests and wound up living the high life in L.A. in a half-acre home.) This 130-foot diameter monster with a steam-ship escape pod (named The City of New York and then renamed The Great Western after the city couldn’t supply enough gas to get the thing inflated) was intended to be a transatlantic traveler. Ready to try this fantastic adventure in 1860, ready to take charge, ready to begin a very problematic trip across the Atlantic in a balloon, Lowe, seemingly ready, had his balloon ripped apart while waiting for launching by a chance and not-horrible wind. Lucky for Lowe and the Union Army, this didn’t happen over the ocean somewhere out of reach, and the North’s important info-gatherer did not sink like a stone in the cold dark sea. (I’m very cynical that the 100-foot-long, bulbously heavy steam-powered “life boat” would’ve landed right-side-up and softly enough to have been of any use save for providing some floaty bits that survivors from the balloon could’ve clung to for a while before being consumed by King Neptune. Lastly for today is this lovely history of balloon and aeroplane flight published in The Illustrated London News for 3 July 1909, called "The Evolution of the Great War-ships of the Air: Balloons, Non-Dirigible and Dirigible, and Aeroplanes, from the Seventeenth Century to the Twentieth Century". It is more fully explained here in an earlier post I made to this blog, laboring the point that 8% of the 60 air vehicles involved a horse. I've written several posts here about floating an airport in the NYC narrows, as well as airports constructed over hundreds of acres of Midtown rooftops, hundreds of small landing strips crossing the Atlantic, innumerable planes and dirigibles with lad fields on/in them, and covering the Thames at Big Ben. (See here for some of these stories.) But I've not seen a floating or hovering anti-gravity airport until now. The question for me would be--why, if you have somehow mastered gravity enough to float a large piece of concrete tonnage like an airport in the sky, why, oh why, are you still using airplanes? "The Professor stared blankly a moment, then rushed away to the office. We followed breathlessly. The outer door had been forced, its lock being broken, but beyond this no damage had been done so far as we could discover. Anxiously we ran over the papers--not a print was missing...."
This is a simple, non-analytical image dump for some in a continuing series on images of New York City in fantastical and improbable situations--there's artwork that show the city being consumed by glaciers, drowned by the tide, ripped from the Earth and flung into the sun, floating in the sea, floating in space, sunken, and of course simply attacked by any number of different things, though most of those weren't real. There is of course the great unknown classic that I stumbled across--the duplicate NYC on a duplicate Earth orbiting the Earth ((?!) and pictured at the end of this post). I doubt that there's enough for a dictionary of disasters, though there's plenty for a Doomsday Book. 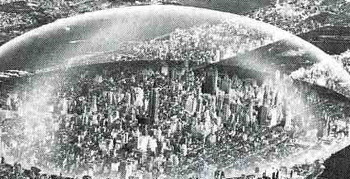 For example the first image for this post shows a domed New York City--and in this scifi sub-classic, like other major cities of the United States, NYC was suffering a catastrophic attack by winged snake monsters. I don't know why the dome is exploding because the snakes don't appear to be armed. There are times when even things that are made to look extraordinary and plainly, outrageously identifiable as what they are, simply aren't--and sometimes they're not even close. For example, this cover of Fantastic Novels (1921?) seems to tell a straightforward story, but as it turns out the giant is giant but one living within a world in an atom of a gold wedding ring. Author Ray Cummings (1887-1957) found a nice writing niche for himself in his fictional discovery of a drug that could make people as small as atoms and then, once inside the microworld, could be made as immense as micro-mountains. The Girl in the Golden Atom was one of a five-part trilogy(? )1 and so far as I can tell, Cummings used the hell out of his original idea. The prose reads like it is punctuated with invisible periods every fifth word2--evidently Cummings was so very busy writing 750 books and short stories that it left him little time to edit or, maybe, think. Briefly and perhaps wrongly put, what I think that happens in this story is this–four guys in a 1919 club do sumpin’, the chemist among them figures sumpin’ out and finds a micro world inside the atoms of his mother’s golden wedding ring where he falls in love with a chick there and goes to visit her himself3; the shrunken chemist finds himself in the middle of a war and grows himself to gigantic proportions in microworld to help out his girlfriend’s people. Or something like that. I don’t feel a need to understand this one. All I want is the cover art. Personally, I’d rather be a giant rather than be miniaturized to somehow fight for my existence in the microscopical world. Sure, finding sources of energy if you were 500 feet tall or whatever is going to be a problem; finding whatever problematic but less so. But at least nothing is going to try and eat/crush/liquidate you in the micro-world, where food is the least of your problems. Color me in big. As I said, all my interest here is in the Frank R. Paul cover art. I find very few images where giant women are throwing tiny men taken from a sea of tiny men into the far horizon. She was speaking to a character named Big Business Man. Makes my teeth fall out. fact, Manhattan was being ripped straight out of the Earth, swallowed along with other Earthly goods and Solar System fixtures by an advancing and ravenous Sol. (I should note that there is a battleship floating upside down over Manhattan--this is the second image of an upside-down above-Manhattan hovering battleship I have seen this week from Mr. Paul, an earlier version seen here.) .Physics problems aside, this cover was just too spectacular to not merit its own post, so that it is easily findable (even amidst the rest of the NYC swallowed/missing/in space/attacked/duplicated posts). Frank R. Paul did the cover art for the story "An Invading Sun" that appeared in Science Fiction for August, 1939, and that's as far as I got with this issue--anything more is destined to be a shrinking denouement. There would've been plenty in the air, as it were, in the summer of 1939 to put the artist and the author in a foul prognosticating mood. The Japanese had already been scourging China for several years now, and Nazi Germany had moved into Austria and Czechoslovakia, and were just about to begin WWII in earnest with their attack on Poland, just weeks away. The 1930's were a glorious decade for physics (and included the Miracle Year of 1932 spiked by Fermi, the Joliot-Curies and Carl Anderson; Oppenheimer and gravitational collapse, the overwhelmingly better-understood quantum theory, nuclear physics, and all the rest...a very busy decade). So the world was coming into a landing of some sort in 1939, what with densely compacted collapsing stars, the discovery of subatomic particles, the real birth of QM and nuclear physics, Nazis, the Japanese running amok in Asia, the death pangs of the Depression panging away, deep anti-involvement attitudes int he US, and so on. No wonder the Earth was being consumed in science fiction fires. Cover art by Frank R. Paul for August 1939 Science Fiction magazine source: Frank Wu's Frank R. Paul Gallery. So something big indeed must've happened to get everyone up in the floating NYC replacement--not the least of which would've been the discovery of some sort of gravity-negating something. I'm not sure what the point of all of that is, exactly, unless these new floating cities are cultivating the Earth, or something, Eden-zing it. perhaps the cities were on the go, somehow, though a sudden start or stop or dip or thrust or whatever might prove devastating, unless there was something invented that would ensure certain laws of motion wouldn't apply to anti-graviationally-platformed floating cities of the future. And if it wasn't going to move, why would you want to go through all of that effort in removing everyone to giant floating city and keep it in the same pace, hovering above its former self. 1. Hamilton's bibliography is located (at least) here. In the History of Lines subcategory in this blog (following the separate histories of dots, holes and missing things) I’ve discussed things like Darwin’s evolutionary tree, the length of the coastline of Britain via Mandelbrot’s fractal geometry and Richard Feynman’s beautiful diagrams, but I’ve not really discussed “stick figures”. They came up briefly in a short discussion relating to the history of published antiquarian drawings by children (and how the earliest drawings by kids look by and large the same over many centuries), but that has been about it. Today though I’ve come across stick figures in a very unlikely place–in a great fresco by one of the finest painters of the human form of quattrocentro Florence. Domenico Ghirlandaio11449-1494 was an enormously popular artist during his day, with many fresco commissions and portraits to his credit; he made good use of eyeball-alone perspective and held a great passion for detail–something that I think got him into a snooty bit of trouble with most of the 20th century’s criticism of his artwork. (Bernard Berenson for one looked down his long and very sniffy nose at Ghirlandaio and announced him a mediocrity.) It cannot be left unsaid that he was also an early and short-lived teacher to Michelangelo. The figures appear to be quite like stick figures from a distance --there they are in the upper-center background above the heads of the seated prelates--but loom less so when given some magnification, when more details come out. Even when looking at the figures this closely, though they still manage to keep a fair amount of the stick-ness, and so contribute a little bit of irony to the beautifully-rendered humans that fill the paintings and frescoes of this great master. I guess that once viewed up close the "stick figure" part of the figures that are seen from far away become less so, but, well, they still seem like stick figures from a distance. Anti-gravity Atomic-powered Sun-fed Underground Woman of the Year 5000! The woman in this picture is rising from her subterranean world in an anti-gravity atomic-powered crystaline homunuclus, flying out for shopping while being fed by sunbeam converters. No doubt there’s something strange going on with earth three milennia in the future–since the Earth no longer supports vegetation, people live underground and eat the sun directly via sciencey voodoo. The artwork is provided by my newest favorite science fiction illustrator, Frank R. Paul, for the 26 August 1938 issue of The Family Circle. And according to the elegant Paul-ophile website, the Frank R. Paul Gallery, the cover article is an interview with the artist, who goes into great detail (again, supplied by the Gallery site), about what exactly is going on in the cover illustration. Without the explanation, I would not have been able to guess the meaning of the images. Another bit of the cover: the blue ball is “solidified energy” of space-time headed into the sun; meanwhile, genius scientists hope that to cushion the exploded sun’s blow to earth by launching burned tired gases into the stratosphere. The rubber gas cushion worked, except that it would up being pierced by a renegade energy blob which crashed into the Earth and via a great miracle cured the Depression. I would not have guessed this. Lastly, the guy at the bottom is not a mad scientist, but a Supreme Intelligence (as Paul tells us, he is denoted so by the "S I” on his chestplate, which evidently does not stand for “Sports Illustrated” or Staten Island”). I guess if the guy's intelligence was really supreme he could've figured out a way to show more than North and South America in the single hemisphere on the chestplate. Earlier in this blog I wrote about odd, extraterrestrial extra Earths--double Earths (like this, for example "Extra-Earth Humano-Alien Souls from Outer Space Repopulate Earth-Hell!") --and then branched out to other strange things found in created skies. This image would certainly classify: its the cover art by the fabulous Frank R. Paul for Stanley D. Bell's "Martian Guns" found in the January 1932 issue of Wonder Stories. There's really no way to determine how big the gun is except to say that it is probably "big"--there's just nothing to place the thing in perspective, as the figures in the foreground, being Martian, don't have a specific height. They could be 6' tall, or 60'--perhaps they're only 1/10 of an inch tale, and the projectile they're firing to the earth is so devastatingly powerful that size doesn't matter. We also have no idea of the used to get the projectile/bomb moving--the nature of the explosive--but it is probable that the resulting muzzle flash wouldn't look anything like what we're seeing here. This depends on the available bits in the microgravity, but I think all that you'd see as a result of firing canon would be a very bright flash of light, and here would be no smoke. Plus lots of other obvious stuff, like, well, the Martians, though at least the gun isn't pointed directly at the Earth, which I think is just a function of fast work. But no matter, this was 1932, and the specs don't matter, as this is, after all, science affliction. The destructive units are finding their targets, though; one seems to have found its mark around San Francisco, and another looks like it might be in France. They're easy to spot, made so for the reader, finding their thousand-mile high smoke plume in a cloudless atmosphere and all. I'm sure it would've been an unsettling experience to the reader of the time. Here's another odd bit, this one seeming to show an exploding Earth--the "exploding Earth" subcategory of the "Strange Things in the Sky" category being among the rarest of these sorts of images. This comes from the January 1932 issue of Science Wonder Stories, from the "Before the Asteroids" article by mechanical engineer Harl Vincent (1893-1968). I can't find the text of the story, so I really don't know if this is the Earth being detonated or whether it is an asteroid--I prefer it to be the Earth, and the exploding thing doesn't look much at all like an asteroid. 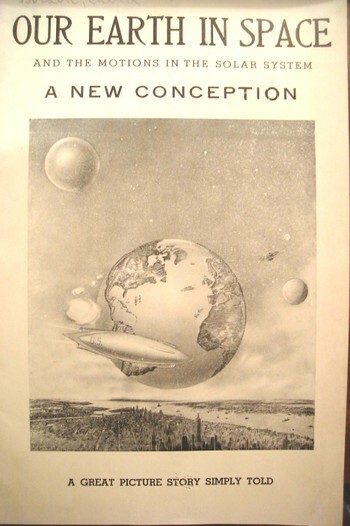 This fantastic image was made for the Australian Alan Connell’s story “Dream’s End” which was published in the December, 1935 issue of Hugo Gernsback’s Wonder Stories (a company resulting from the merger of: Science Wonder Stories and Air Wonder Stories and then continued as Thrilling Wonder Stories). The floating battleship illustrates a point in Connell’s story about the frailty of reality, the slim margins of appearance, and how easily everything could seem strange and foreign if subtle changes are made in the fabric of the physical universe. Actually, it was much more than that, and the subtlety quickly fades as Connell’s story lifted reality up and away from humanity, producing all of not only the earth but the entire universe as a piece of a some larger intelligence’s dream. It is the story of a fragmentation of all reality as the being ends its dream and begins to awaken. “Vol 7, No 6. 132pp. Cover art by F.R. Paul suggested by "Dream's End". The cover and table of contents list December as the publication month but the editorial credit page lists November-December. Paul is credited as the cover artist based upon his signature. Oliver Saari has two different letters. A section headed "In Your Opinion" in the letter column lists the fan favorites from the September issue in descending order as "The Green Man of Greypec", "The Ideal", "World of the Mist", "The Space Lens", and "One Hundred Generations".-- From the ISFDB website. Standard introductions to Magritte miss what I most see in his work–it seems to be in a constant state of removal, of emptying, and blankness. And this is the case even when the canvas is full of images, even when it is full of people, raining people–the underlying effect to me is still the same. The man just painted blank spaces in full color, some of the most colorful nothingness I’ve ever seen. Many of Magritte’s strikingly delineated paintings suggest and portray missing things and emptiness with shadows and barren places, but even when they’re populated by human figures there’s a long memory of the same sort of thing: half torsos, bagged heads kissing, the backs of people facing a mirror in which their back is reflected, empty feet, half-humans, hidden faces, floating hats, draped bodies, the half-disappeared, and so on, all speak to the same emptiness. Perhaps this sense is strongest in me when I see his Perspective: the Balcony of Manet (ca. 1945), especially side by side with the Edouard Manet The Balcony (1868). I know its unfair to compare the two–but Magritte started it–but Manet is hardly an empty, blank painter. Once Manet moves through the 1860's and into real modernity, he is able to paint colossal senses in the boundaries between objects, boundaries that are really mostly suggestions than demarcations. Following this week's posts Occupational Alphabet and Touch of Evil action Alphabet is this constructed alphabet of Dada-like images, non-sequiturs taken out of context and which--once placed on a their own stage and on their own easel in the strong Borges tradition of the reader making the book--strongly remind me of the Marcel Duchamp readymades. The source is Kantner's Illustrated Book of Objects and Self-Educator in German and English, a self-teaching book for German vocabulary, published in Pennsylvania in 1879. The woodcut images used to illustrate each word are fantastic, and occasionally stunning, sometimes unexpected illustrations of forgotten objects and actions. I've selected the images that have selected themselves, mostly-solitary images infested with that uncommon, simple quality that illuminates them as Dadaist. The alphabet is sadly not complete--j, x,y and z were lacking images. A friend of mine started her facebook post writing “Ovary shipped out...”, a great piece of found story-beginnings, a great opening line, especially when ovariotomically removed from the rest of the sentence. Alex is an artist and medical/anatomical illustrator by trade, so I knew what she meant–but forgetting that made the segment even more lovely. Aside from the fiction that the three words created and the half-word that I created/butchered, I wondered about when ovaries were first surgically removed, and then about how the ovary was seen (almost forever) as the home and birthing place of the fully-formed human delivered to it by men in the act of ya’ know. Ovarian surgery really didn’t exist until the early 19th century, when it was practiced with great success (especially for its time1) by Ephraim McDowell (1771-1830), in 1809 in Virginia–and it was also about the first great American contribution to gynaecology as well His first patient (“Mrs. Crawford”) sang her way through an anaesthesia-less procedure, surviving her illness and the surgery at a time when non-amputational surgery was half-fatal.2 There were other, limited reports of this procedure, but for reasons not clear to me it didn’t really start appearing as a general procedural possibility until mid-century. Anyway, before the 19th century, women with ovarian cysts were pretty much out of luck. But the issue of the ovaries as ovens--of homunuclus and palingenesis and epigenesis, the imaginary male-dominant anatomy of reproduction–was pretty much somewhat solved by the end of the 18th century. Or at least the homunculus, the tiny but perfectly formed miniature human traveling along in sperm, was. This character is pictured here, riding in the squinty-eyed imagination of researcher Nicholas Hartsoeker3, who desperately wanted to see the thing, and which found itself published in his book Essai Dioptrique in 1695. The woman as a simple baker of a gift of preformed life was a medical belief that helped perpetuate the supposed inferiority of women, and that the woman’s part in the procreative process was a simple oven. It was a difficult image/belief to resist, persisting well into the 19th century. Anyway, this is where my thinking took me–to the anatomically-inspired subjugation of women–from Alex’s comment. 1. This was still in the deep, dark time for hospitals and surgery, in general. Remember that Joseph Lister was still a half-century in the future with his revolutionary surgical practices that were invaluable to the cause of successful surgery. And hospitals in general were bad throughout Europe, though their story in England at this point was entirely different. The Brits really took steps forward in the treatment of the sick, and especially in the treatment of the poor sick, thanks to being a little awash, splashing around in waves of money provided by their contributions to the industrial Revolution. Funny how it takes major mounds of money-making to initiate good works like that, but, never mind the details–it was done, and hospitals in England during this period were comparative oases in regards to European/Continental hospitals. ** McDowell’s first three cases were all successful , finally published in the Eclectic Repository for 1816. This was the first real foray into this field by the pioneering American medical institutions; obstetrics and gynaecology before this, and particularly in the 18th century, was pretty much in the hands of the French (especially obstetrics) and the English, and to some degree the Italians (particularly with Mascagni, Santorini and Spallanzani). **This is probably unkind and not particularly true of Hartsoeker, who never said that he actually saw the little men of sperm, and had simply postulated them. Maybe the squinty-eyed part was imbued in the minds of others, though it was Hartsoeker who drew the images of the homunucli to begin with. I think that he should’ve rested in his better cups–he was a gifted mathematician and a particularly good microscopist and optical person, and probably should’ve restricted his published biological theories to his notes.